New Blurb! Really hoping for more Ranger in this book! 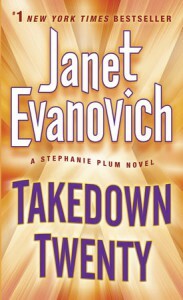 I can't get enough of him ;)From Evanovich's Website...New Jersey bounty hunter Stephanie Plum knows better than to mess with family. But when powerful mobster Salvatore “Uncle Sunny” Sunucchi goes on the lam in Trenton, it’s up to Stephanie to find him. Uncle Sunny is charged with murder for running over a guy (twice), and nobody wants to turn him in—not his poker buddies, not his bimbo girlfriend, not his two right-hand men, Shorty and Moe. Even Trenton’s hottest cop, Joe Morelli, has skin in the game, because—just Stephanie’s luck—the godfather is his actual godfather. And while Morelli understands that the law is the law, his old-world grandmother, Bella, is doing everything she can to throw Stephanie off the trail.It’s not just Uncle Sunny giving Stephanie the run-around. Security specialist Ranger needs her help to solve the bizarre death of a top client’s mother, a woman who happened to play bingo with Stephanie’s Grandma Mazur. Before Stephanie knows it, she’s working side by side with Ranger and Grandma at the senior center, trying to catch a killer on the loose—and the bingo balls are not rolling in their favor.With bullet holes in her car, henchmen on her tail, and a giraffe named Kevin running wild in the streets of Trenton, Stephanie will have to up her game for the ultimate takedown.